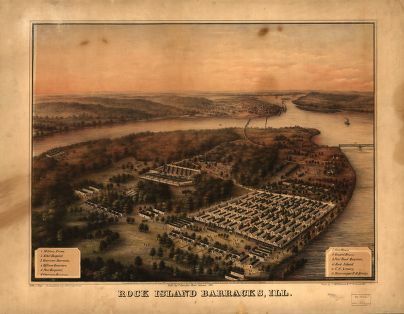 Rock Island Arsenal is the final post of the Illinois Civil War POW Camp series that has highlighted the three other (3) Illinois Civil War POW camps: Camp Butler, Alton Penitentiary, Camp Douglas. Rock Island, or Arsenal Island, is located on the Mississippi River between Davenport IA and Moline Il and is the nation's largest government owned (and operated) arsenal today. The Rock Island Prison Barracks held over 12,000 Confederate prisoners between December 1863 to July 1865. Although the Civil War barracks no longer stand, there are two cemeteries. There are 1,964 prisoners in marked graves at the Confederate cemetery. Also on the site is the Rock Island National Cemetery (1863) the burial site of 125 Union prison guards; forty-nine (49) from the 108th Regiment, United States Colored Troops (USCT). For an online search of names of the interred visit The Rock Island National Cemetery, Interment.net website. More Prison information can be found at the second oldest US Army Museum, Rock Island Arsenal Museum. You may be easily led to records, if you find that your ancestor joined the Confederacy, but after the war received pension payments offered to Union soldiers. Could it be your ancestor was a "Galvanized Yankee? 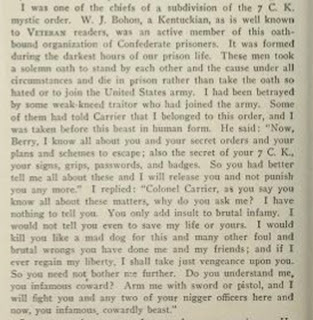 : A Confederate Prisoner of War who took the Oath of Allegiance and joined the Union Army. Did your Confederate solder serve as a US Volunteer for the Union? What has not been discussed in this series are the Galvanized Yankees who served first as Confederate soldiers and late 1864-1865 converted to Union soldiers. Perhaps here we should review the characteristic of galvanized metal. It turns colors when it is coated with zinc. There were 6 regiments, abt. 6000 men, who formed the U.S. Volunteers with the enlisted men having been recruited from prison camps. 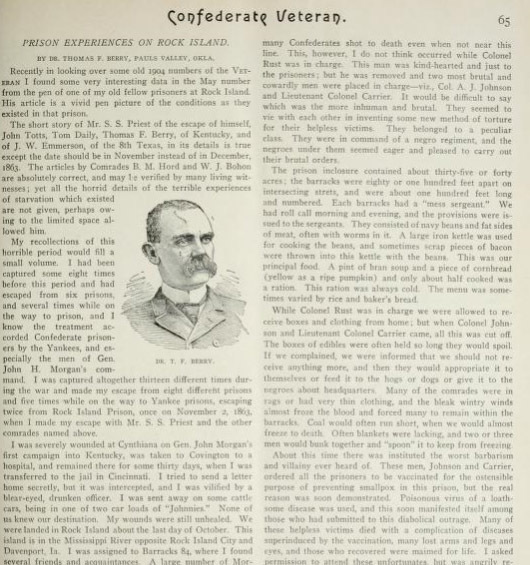 Three of the four Illinois Confederate prisoners (joining other Union POW camps) proffered a substantial number of men who would later be called Galvanized Yankees (Alton, Camp Douglas, and Rock Island). Rock Island prisoners formed the first two regiments in February of 1865 that were trained in Ft. Leavenworth. Although much more can be said about Galvanized Yankees, you may wish to extend your POW search to Ft. Leavenworth records. Your ancestor may be found stationed along the Wagon Train trails from Missouri to Montana, Utah or California. for information on the trails visit: Wagon Trains 1840-1860. Galvanized Yankees, untrusted by the Union, usually can be traced to the western states protecting settlements and battling the Indians at the end of the Civil war or shortly after. They may have taken up residence in a western state after the war. They were not accepted into the Union's celebrated Grand Army of the Republic (GAR), and were usually shunned in their southern community. Many settled west of the Mississippi after the war. Most Galvanized Soldiers may be found through Union pension records. Some of the Confederate prisoners were enlisted in the US Navy. M1017 Compiled Service Records of Former Confederate Soldiers Who Served in the 1st Through the 6th U.S. Volunteer Infantry Regiments, 1864-1866 (65 Rolls). Prison life at Rock Island was horrific, as was all of the Illinois POW camps. But desertion for any reason was unacceptable to seven Confederate prisoners held in Rock Island. These seven men, took on the motto "Dulce et decorum est pro patria mori" or It is sweet and glorious to die for one's country and formed the Seven Confederate Knights (7CK). 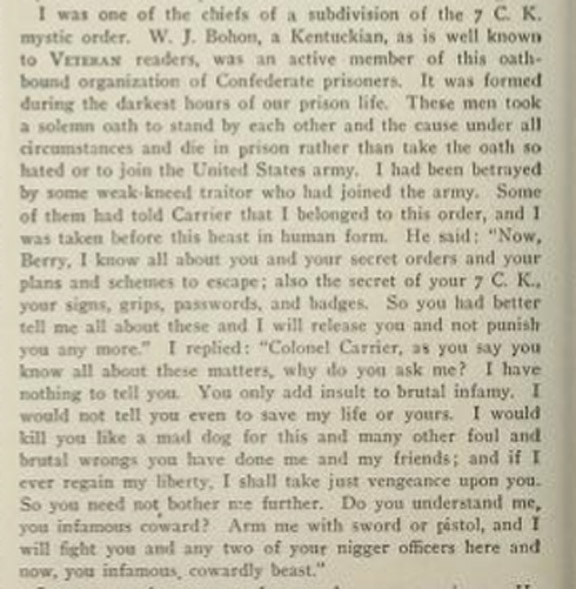 For detailed information on the 7CK activity and many member names of this secret society in the Rock Island prison, be sure to review Confederate Veteran, Volume 20, Issue 2, pages 65-69. This collection of memoirs and Civil War recollections can be a useful tool to any Civil War researcher (Union or Confederate) based on its historic value. Good post, Kathleen! 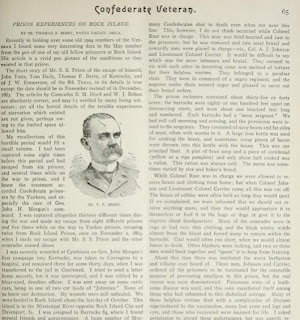 My 3rd great-grandfather was a prisoner at Rock Island, who became a Galvanized Yankee. He served the remainder of the war at Fort Kearney, Nebraska. You've given me some good tips here for further research.